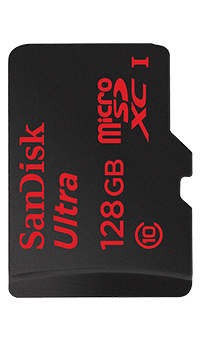 The SanDisk 128GB microSD Memory Card can store up to 128GB of photos and videos. And with state-of-the-art recording technology, you can capture exciting moments in Full HD. We'll let you know when we have updated stock information on the SanDisk 128GB microSD Memory Card .